My new book Who Turned on the Heat? – The Unsuspected Global Warming Culprit, El Niño-Southern Oscillationis now on sale in pdf form for US$8.00 – Please click here to buy a copy. (Paypal or Credit/Debit Card). The Updated Preview includes the Table of Contents; the Introduction; the beginning of Section 1, with the cartoon-like illustrations; the discussion About the Cover; and the Closing. I have been studying manmade global warming/climate change/climate disruption/insert latest catch-name here for a decade or two. I understand the hypothesis of anthropogenic greenhouse gas-driven warming of surface temperatures and of the global oceans. In fact, early on, I was a true-blue believer in the assumption that man was responsible for most of the recent global warming. A TV special in the early 1990s sparked my interest. In it the camera followed a climate scientist into a glass-walled room with a massive mainframe computer, and the scientist said it took months for the computer to simulate global climate for some period of time—whether the computer was simulating climate for decades, centuries or millennia, I don’t recall. Whatever the time span, the computer sat number-crunching for months to give the scientist an output. I was impressed. The climate scientist, if memory serves, was Dr. James Hansen of the NASA Goddard Institute of Space Studies (GISS). My skepticism began with the ever-increasing number of reports of projected climate catastrophes. That was, from my recollection, sometime in the early 2000s, about the time I retired. Many of the predictions of impending disasters sounded extremely familiar, but earlier they’d been blamed on something else. If you’ll recall, starting in the late 1990s, everything was blamed on El Niño. Remarkably, many of the weather events now being hyped as greenhouse gas-related catastrophes by climate scientists and the media had previously been blamed on El Niño. It was as though the climate scientists didn’t like being upstaged by Mother Nature’s son El Niño, so the scientists tried and have been pretty successful, with the help of like-minded reporters, at redirecting blame to manmade greenhouse gases, primarily carbon dioxide. The blame game has reached such epidemic proportions that there are people who now actually believe global warming is causing the extreme weather events, including, depending on the season, heat waves, cold spells, flooding, drought, blizzards, reduced snow cover, etc. Just in case you’ve forgotten or this happened before your time, there are dozens if not hundreds of El Niño cartoons on the web, blaming El Niño for everything under the sun. Some can be found on the webpage of El Niño cartoons from the Florida State University Center for Ocean-Atmosphere Prediction Studies (COAPS) website. Of course, there’s the October 25, 1997 NBC Saturday Night Live sketch with Chris Farley as El Niño. A copy of the script is here and a YouTube copy of a portion of the sketch is here. Back to my backstory: In short, because of all of the predictions of impending doom and gloom, and because the cause of weather events had been transferred from Mother Nature to man, greenhouse gas-based anthropogenic global warming started to look hokey to me. Really hokey. My interests ebbed, and my studies slowed for a while; then I caught the global warming bug again. 70% of the surface of the Earth is covered by oceans, sea and lakes. 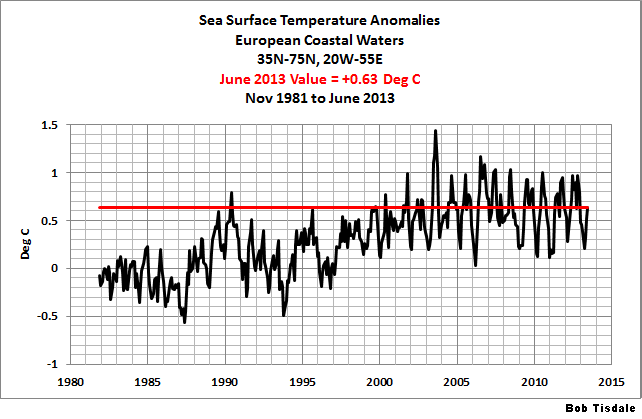 Sea surface temperature records interested me, but I could find little information online. No one was blogging about them. I then discovered the NOAA National Operational Model Archive & Distribution System (NOMADS) website, which allows users to investigate many climate-related datasets. One of them was the now-obsolete NOAA extended sea surface temperature reconstruction dataset ERSST.v2. All a NOMADS user had to do was enter the desired coordinates and NOMADS produced the data. How convenient. So I started investigating. Not long after, I opened my blog Climate Observations and began publishing posts about sea surface temperature data with lots of time-series graphs. Lots of time-series graphs. Now, if you were to do a Google image search for North Atlantic sea surface temperature anomalies or SST anomalies, for example, you’ll find my graphs and links to my posts. As I began to divide the ocean basins into logical subsets, I noticed a reoccurring phenomenon: upward shifts in the sea surface temperature anomalies. Most of those shifts looked somewhat like step changes, but they also had characteristics of a saw tooth, with a sharp warming followed by multiyear cooling. In January 2009, I published my first two-part blog post on the ENSO-caused upward sea surface temperature shifts. The posts were Can El Niño Events Explain All of the Global Warming Since 1976? – Part 1 and Part 2. They were also cross posted at WattsUpWithThat, so you may be interested in the comments on the threads here and here. If you’re not familiar with WattsUpWithThat, it’s the very popular weblog hosted by Anthony Watts. WattsUpWithThat is the internet’s most-viewed website on global warming and climate change and has been voted winner of numerous weblog science awards. Having Anthony Watts select one of your blog posts to cross post at WattsUpWithThat is big-time for a climate change blogger. About 125 of my 500+ blog posts (as of this writing) have appeared on WattsUpWithThat. Some of you might be thinking the visitors to WattsUpWithThat simply agree with anything printed there and that they simply pat the author on the back, providing “pal review” for the authors of guest posts. Wrong you’d be. WattsUpWithThat is primarily visited by skeptical persons. They’re skeptical of other climate skeptics in addition to being skeptical of anthropogenic global warming. If there’s a flaw in your argument, it will be found and noted. Regular visitors there include physicists, oceanographers, statisticians, college professors, meteorologists, and climate scientists. WattsUpWithThat is also visited by proponents of manmade greenhouse gas-driven climate change. They provided the myths and failed arguments that were addressed in Section 7 of my recent book Who Turned on the Heat? Many of the discussions in its Section 4 were also prompted by their failed arguments. In the 3 years since those two blog posts about El Niño-Southern Oscillation, I have confirmed the observations, expanded on them, and detailed ENSO processes using numerous datasets and animations created from data. I’ve presented those findings in dozens of blog posts, with each of those posts being scrutinized by people who are skeptical of just about everything. The sharp rises were, in fact, responses to major El Niño events, but there were no sharp decreases associated with the La Niña events that followed them. Yet we’re told that a La Niña has the opposite effect of an El Niño. 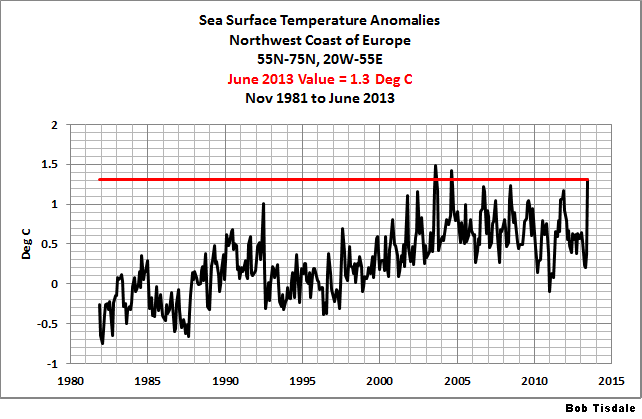 The surface temperature record clearly indicates they are not opposites. That’s one of the fundamental messages presented in this book. Also, to be able to grasp why that’s important and how it contributes to the long-term warming of global surface temperatures, one needs a basic understanding of the processes that cause El Niño and La Niña—and their long-term aftereffects. So I wrote a book. People have been asking me to write this book for the past couple of years. If you’re wondering, I still understand the hypothesis of anthropogenic greenhouse gas-driven global warming, and I still believe it has an impact on the warming of land surfaces, albeit a small one. So if you want to categorize me based on my findings, I’m a lukewarmer—definitely not a global warming denier, though some have called me that. Classifying me as a denier is kind of silly when you think about it. Most of the data I present shows temperatures have warmed. I simply present it ways that allow it, the data, to explain why it has warmed. You could also categorize me as an independent climate researcher. There aren’t many independent researchers investigating El Niño-Southern Oscillation or its long-term impacts on global surface temperatures. In fact, if you were to perform a Google image search of NINO3.4 sea surface temperature anomalies, the vast majority of the graphs and images are from my blog posts. Try it. Cut and paste NINO3.4 sea surface temperature anomalies into Google. Click over to images and start counting the number of times you see Bob Tisdale. 4. the data the readers need to research the subject on their own, if they desire, is available to them in an easy-to-use format. Bob Tisdale is a retiree who is presently looking to return to the workforce or for funding that would allow him to continue his research into, and blog posts about, the El Niño-Southern Oscillation (ENSO) and other natural causes of global warming and climate change. His blog posts here at Climate Observations include periodic updates of Sea Surface Temperatures (Example) and Ocean Heat Content (Example), and detailed presentations of the multiyear aftereffects of El Niño-Southern Oscillation events (Example), of the natural causes of the rise in Ocean Heat Content since 1955 (See here, here, and here), and of the other modes of natural sea surface temperature variability such as the Atlantic Multidecadal Oscillation (Example) and the Pacific Decadal Oscillation (Example). Bob has also prepared posts that illustrate the multiyear impacts and aftereffects of the El Niño-Southern Oscillation (ENSO) on combined global land+sea surface temperature data (Example) and on Lower Troposphere Temperature (TLT) anomalies (Example). And he has prepared posts that show how poorly the Coupled Climate Models used by the Intergovernmental Panel on Climate Change (IPCC) actually represent past sea surface temperature variations, calling into question their use as attribution and climate projection tools (Examples here, here, and here). Bob’s “Introduction To” posts on natural modes of Sea Surface temperature variability; the El Niño-Southern Oscillation (ENSO), the Atlantic Multidecadal Oscillation (AMO), and the Pacific Decadal Oscillation (PDO); are visited daily by those looking for easy-to-read, well-illustrated, and detailed but basic discussions. In many of his posts, Bob uses animations of sea surface temperature anomaly maps (Example) and Ocean Heat Content anomaly maps (Example) to help illustrate the discussion. Like all skeptical climate change bloggers, Bob Tisdale relies on you, his readers, for support. Many of Bob’s posts are cross-posted at Watts Up With That? (WUWT), the very popular weblog hosted by Anthony Watts. This more of a test run plus a question. I was reading a paper on sonar signals in the ocean and how the speed increases with depth (this relates to the Air-France crash in the Atlantic and its detection) and suggestion was that summer warm water tended to keep the ocean layers intact because of surface warming but winter with colder air and sea turbulence from more frequent storms would allow for cooler SST’s and allow by convection the warmer water from below to rise to the surface. It was a reputable paper but is this a reasonable assumption ? Sorry, Keith, can’t answer your question. I haven’t studied that portion of it. I’d like to monitor your posts, but couldn’t find an RSS feed of your site. This is an (important) feature of WordPress. If you do provide the subscription feed, can you tell me where it is. You should consider making this more obvious. If there is no feed, can you provide one. It would let interested reader track your important information. I am in the middle of a debate with the Nature Conservancy which has partnered with GISS. Keep up the good work. I will be including some of this in my upcoming presentation in Guilford Ct on the 17 of May. It involves Coastal Resilience which appears to be nothing more than a big land grab that is to be nation wide. Guilford is one of the pilot projects along with Old Saybrook and South Bay on Long Island. It is important to stop this in the bud. Jim Reekes: Sorry. I just added the RSS links. thanks for your very detailed and animated work which significantly adds to the understanding of these very complex processes. its a great site, but one major point which has distorted almost all of the SST data, particularly at the equator where the warming is applied by solar energy, is for example that at a latitude of 20N each grid square is about 15% smaller than at the equator. By changing the SST data into SSE (energy: specific heat capacity of sea water = 3993j/kg/C x relative surface per grid square) one is better able to understand the dynamics of the change in applied force i.e. how the net solar energy absorbed by the sea surface has changed. Comparing mean 1880/1930 to 1931/2009 SSE, i.e. before/after CC, we can note that a warming pattern off the W African coast (5S to 20N) spreading into the Caribean, is consistent with both the droughts in the Sahel (expansion of the Sahara) and Global Mean Temperature….. This points to the warming pattern (CC) being caused by the reduced cloud/moisture flux from the Sahel.Unfortunatly the CC arguement wrongly relies upon the Atlantic SST being causative in the Sahelian droughts. One certian senior scientist at a notible climate institute asked me 4 times not to format this data???? If you want to look for the smoking gun in this unhappy story, look to the reduction and eventual disappearence of a warm, shallow, freshwater, 25,000 km2 lake which had appeared in the NE Sahara for the passed few million years: the annual flooding of the Nile Flood Plain. Oops! I’m speculatingn here, but the reduced evapotransportation from the Flood plain which had been pulled south into the Horn/NE Sudan reduces the frequency/magnitude of squall lines/easterly waves which travel westward across the continent and into the Atlantic, hence the increased solar energy. This you think can not possibly effect such a large warming pattern? We are looking at about a net 200 watts per day of energy within the time frame, this equates to about an additional 1/2 second of additional solar energys, easily within the parimeters of the Sahelian drought cloud flux deficit arguement. This 1/2 second being spread over +10,000,000 km2 of of Ocean. Irrespective of the apparent absurdity of the arguement, the numbers do add up. Please provide a link, Conor. Thanks. Pingback: Tisdale on model initialization in wake of the leaked IPCC draft | Watts Up With That? Following up on a suggestion about income-generation someone made a month ago, I personally got involved with leapforceathome.com, and went through their study/examination process. Not easy, not trivial. The work is rating of search engine results, on a detailed scale. I’ve just begun actually doing the work (using a dedicated FF profile with the addon tools they provide), so don’t have much OTJ feedback yet. If $13.50/hr base rate with full discretion on how many and which hours (minimum about 7-8/mo.) is of interest, check them out. Pingback: Tamino Once Again Misleads His Followers | Watts Up With That? Pingback: New and Improved CRUTEM4 Global Land Surface Temperature Data vs IPCC AR4 (CMIP3) Climate Models | Watts Up With That? Geoff Seidner: I haven’t a clue how you would change the email link at your webpage. Since you included it in your comment, I haven’t posted your comment. Dear Bob re my article (November 13, 2011) on how man-made changes to the Nile flood plain (since 1902) has altered Sahelian rainfall, then cloud/moisture flux over the Atlantic/Pacific, thus allowing for more solar energy (consistent with published CC data) to be absorbed by the sea surface. This additional energy (heat) then distributed as the sea current carry the additional energy N & S. If you can send an e mail address I can send you the Aswan Sahel chart ~ everything from there is basic and I will not bother you with the detail unless you make a specific request. If this is not the smoking gun we are looking for then I don’t know what is. Conor McMenemie: Please provide a link to the article so that others can read it. Dear Bob: I am a director of a tidal energy R&D co, the work is an unpublished bit of my own research and is not formatted in the convention way. Having it reviewed (Dr Carl Bountempo.- Senior Scientist Met Office, Prof Paul Hardaker – Chief Exec RMetS. Dr Grimes Reading Uni. Prof Ralf Toumi – Imperial College London. Compton . Tucker – NASA. Dr Geir Lundestad _ Director Nobel Inst). I have been met with silence or fiction, thus any useful attempts at formal publication are thwarted. I can send you the original chart and associated material (sufficient of the Nobel Inst) and you can decide how best to attach to your blog. Conor: Has your paper been published anywhere else, at a blog for instance? You could then leave a link. If you’re asking me to publish your paper at my blog, sorry, that’s something I don’t do. I publish only my own investigative/research work here. My work has not been published. Since the main theme is that the dams on the Nile at Aswan* have affected the rainfall in Sub Saharan Africa (since 1902), the political implications are enormous. This same reduced Sahelian cloud/moisture flux into the Atlantic producing a seasonally migrating SST warming pattern, consistent with published data for global mean temperature, again raises very uncomfortable issues with the climate community: I had asked a senior police officer to be present at my 2 hour meeting with the Chief Exec of RMetS, this was to ensure that there would be a credible witness to the BS which pervades every presentation of the Nile problem: despite accepting that the reduced Sahelian cloud/moisture flux would produce a migrating Atlantic SST warming pattern, when I produced this patters he said it was caused by CO2 – complete BS. This same senario had been acted out with a so called climate expert for the world food programe. NOBODY WANTS TO KNOW that man made changes to the Nile Flood Plain have had a massive effect upon the equitorial weather systems, you might include a generalised weakening of the ITCZ because one of its moisture contributing elements has reduced/disappeared. If you are searious about SSTs then we can both work on this; I am patenting and prototyping tidal turbines, not a meteorologist or accademic. *The dams were originally designed to withhold the latter part of the annual flood to allow for the Egyptian cereal crop to be larger and harvested at the same time each year, so the merchent shipping fleet would be on hand to distrubute it thru the commonwealth. The high dam stopped the flood completely ~ The operation of the dams affectivley changed the surface area of a 26,000 km2, warm, shallow, freshwater lake in the Sahara which had contributed to the Sahelian rain budget from mid July for the passed few million years.Thus the strong correlation between Aswan Runoff and Sahelian rainfall. Seems to me the Sahara had greened and dried a few times before the Aswan was built. True, but when correlating Sahelian rainfall with the Aswan run-off, one has to take into consideration that the dam opened in 1902, was enlarged from 1907 to 12, again from 1929 to 33. From 1960 to 64 the river ran freely for the first time since 02 and the new dam began to affect river flow from 1964. The Sahelian rainfall varies consistent with those dates; so we have to question why this happens. Re the recent greening of the Sahel; in 1999 Uganda opened its 40MW hydro-station at Owen Falls on Lake Victoria, allowing for an additional 60 km2 (plus) of water to flow into the Nile. Much of this was diverted into the Toska Lakes in Egypts southern desert. These new lakes have been evaporating back into the Sahel/ITCZ. They are nearly totally dried up now, so we might consider that the very recent regression of the Sahel may be an effect. If any of you can tell me how to attach a chart to this please let me know. Arno Arrak: Thanks for the kind words and tips, Arno. I’m not sure what type of stunt you’re trying with your suggestion that I contact you for assistance. You are well aware that I understand ENSO, more so than the what you’ve written above. I’ll pass on your kind offer. Ahem! Might I add a word or two. The Sahel drought (expansiobn of the sahara etc) involves as mentioned a cloud/moisture reduction which is carried westward by the ITCZ. This deficit had passed around the north of the Andies then spread westward in the Pacific (it dose not appear to migrate seasonally as in the African context – see my posting: Nov 13 2011). I had avoided tackeling the Nile/Sahel effect in the Pacific since ENSO would make the matter more complex, never the less there is a profound warming of the central Pacific which lies outside of the El Nino/La Nina arguement, yet is concurrent with the Sahel event. Use the methodology as shown in my earlier posting et voila, you have an underlying warming pattern consistent with a weakening of the ITCZ. Read it and weep! 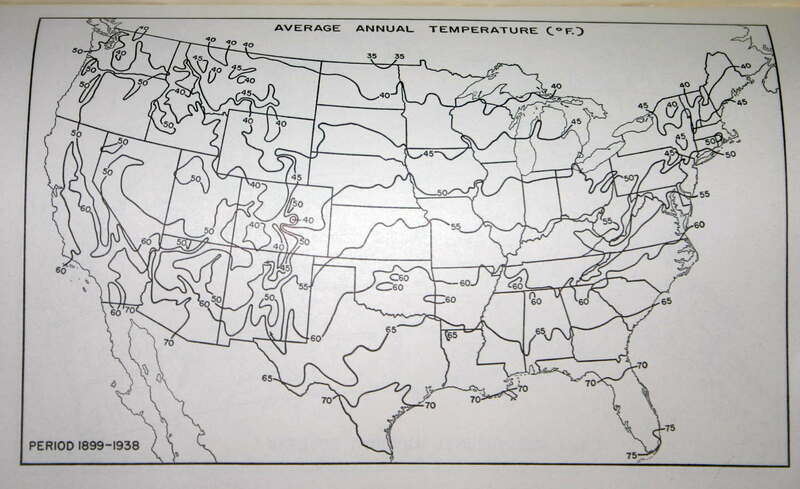 This is a graph from a 1941 Department of Agriculture book. Is there anyway to make a a similar graph using the data that NASA, GISS etc are currently using for the same time period to see what differences there would be ? Thanks, I will give it a whirl !! NiCE try, but no Cigar: cheak out SST variability off the W African Coast (consistent with CC) then compare that to SST of the sea current flowing into the area i.e. down the W African coast from the North. Subtract the the colder northern flow from the warmer W African SST and this will give you the actual temp variability in any given year; solar energy absorbed by the sea. Invert these figures and this will provide you with the exact variability consistent with changes in Sahelian cloud moisture and rainfall. The Met organisations are working on the WRONG assumption that this sea temp variability is responsible for the changes in Sahelian rainfall, despite the fact that the sea warming pattern is downwind relative to the ITCZ (and upwind of the El Nino event). The met office seem to have forgotten that if you reduce cloud and moisture within the ITCZ then more solar energy will be absorbed by the sea, warming it up (consistent with CC). The bottom line is that man made variability in the 1 km3 of evapotransportation from the Nile flood plain which had been pulled south per day into the NE Sahel has inturn affected the mass and frequency of Easterly Waves which, as mentioned, will also affect Atlantic/Pacific SST due to the variability in applied energy – solar. Irrespective of you incredulity, the formatting of all the data points to no other possible conclusion. SST data = HadISST1, Sahelian Pricipitation = Nicholson’s African pricipitation Dataset (1901 – 84). Nile Flow at Aswan GRDC. Conclusion: the ‘recient greening of the Sahel’ is in the passed (see the recient flooding of the Toska Lakes and apply the above rule), Easterly Waves eminating from NE Sahel have again reduced, causing the droughts in E Africa last year, West Africa this year and crop failures in the US Mid West this summer (corn). This slide is just going to continue year on year because the ‘climate experts’ are too weak and stupid to question how a 0.6′ air temp increase can cause a 0.6′ sea temp increase, when the latter figure requires 3,500 times more energy to achieve! Call me Cassandra! Conor McMenemie: Who are you replying to and what are you responding to? I had been provided with an e link to Matthew W’s response to your comment re a book on El Nino being the cause of CC (Sept 11). I’m still flogging the Nile issue to anybody that will listen. Personally I am really afraid of the Mid West droughts; they change the whole picture economically and politically. I’ve turned into a doom sayer unfortunatly, but that is the way things are- start thinking 1 -3 years. How did anybody calculate ocean heat content increases prior to ARGO? I see graphs going way back pre ARGO ( i.e pre 2000) but don’t see what instrumentation was used to get the data. Can you clarify? Colin, the primary instrument they used was a device called an XBT, for expendable bathythermograph, which is basically a thermistor connected to a long, thin wire that was dropped over the side of a ship. The XBTs did not measure depth so they had to compare the time they were dropped overboard and the time of measurements versus fall-rate charts to establish the depths of the temperature readings. I just noticed that the Gulf Steam is becoming weaker. It appears to be dumping more heat off of the American Coast [by Maine] and it is not making it to England/Europe. Any past historical graphs? What do you think? Hi Dr. Lurtz. You’ll have to show me what you mean by the Gulf Stream becoming weaker. Are you discussing volume of water being transported north? If so what dataset? 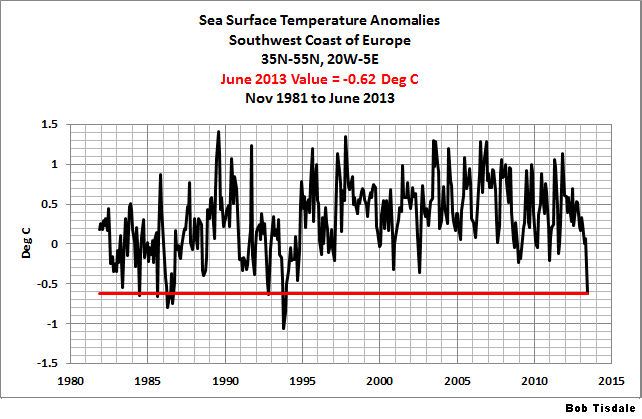 Are you discussing sea surface temperature anomalies? If so, what maps are you referring to? Surface temperature anomalies -> http://weather.unisys.com/surface/sst_anom.gif . Off of the Coast of Maine the anomalies has been there for about a year. Previously, not there. The volume of water [inferred lower temperature by the reduced temperatures in the Gulf of Mexico] -> http://rads.tudelft.nl/gulfstream/ . Unfortunately, there doesn’t appear to be any long term graphs of the Gulf Stream by Europe, unless you have some? I did, however, take a recent look at the SST anomalies of the SW coastal waters off Europe but haven’t gotten around to posting them yet. Thanks for the reminder. Based on the Unisys maps it looks like the cool spot has moved a little farther offshore than the last time I looked, but this will give you an idea. Let’s keep a watch on the warm NW anomalies. I think that as the Gulf Stream slows, the warm spot will move further SW, and the cold spot near England will expand. I also expect a huge rebound in Arctic Ice as this Solar Cycle 24 winds down. With the -> http://rads.tudelft.nl/gulfstream/ , we can watch the magnitude of the Gulf Flow. Haven’t been to your site in many months. I was a marine fisheries biologist who at one time specialized in large pelagic fish biology and management therefore had a long interest in ocean currents.. I began to have problems with the whole idea of anthropogenic global warming, when I heard some scientists at AMOL in Miami refer to it as a “Proven Fact” not a hypothesis not even a theory. That was in the late 1980s. One of the big issues driving the game at the time was the fact that it appeared the billions of funding from DOD, washed through a variety of funding sources, was going to dry up. That meant all the graduate students, professors, etc would find a hard time finding funding. The average citizen really doesn’t appreciate that most of the money for climate research is controlled by the federal government. In turn the bureaucrats controlling where that money goes or doesn’t are devout about their belief that anthropogenic global warming. As you well know they are helped by the popular media in maintaining any public interest and attacking anyone that dare question them. But that is not why I write. Once upon a time when ASW (antisubmarine warfare) was a priority of DOD the Navy would set off underwater explosions and then track “sound wave” around the world’s oceans. I was told that from such data one could determine changes in the thermal capacity of the oceans. With the rebranding of the Soviet Union and the fact that DOD had to complete EISs such annual testing ended. The environmental community convinced a judge that dolphins and whales were going deaf because of the explosions. I understand that such data are still classified. However, it would certainly sway the debate one way or the other. Instead none of those predicting the end of the earth will be alive to face the blame or accept congratulations when their predictions actually are proven one way or the other. Bob, when I was writing the submission for the UK parliament I wanted exactly the article you produced to show how all the predictions had failed. Although it is well past the submission date, when I saw your comprehensive list on WUWT I thought about sending it to them. But I thought I should contact you to discuss. I hope this gets to you. Scottish Sceptic, please feel free to present what you like. But I’m wondering what list you’re referring to at WUWT. Anthony has published hundreds of my posts there. Hi Scottish Sceptic – it must be something in the water! I have made a submission to the forthcoming E&CC Committee’s AR5 review, with a strong emphasis on the IPCC’s 100% failure rate at backing a winner insofaras determining what is causing CC. My figures show that a reduction in the equitorial easterly wave cloud mass is making the equitorial oceans warmer due to it being sunnier – about 1 peta watt hour per day sunnier since the mid 60s (and about half that from mid 60s to 1900). I think that the world will begin to see reason now that Hansen got the boot from NASA. It would be really useful to me if you were to summarise the key points re their failure rate to see if it lines up with mine! If you have a background in operational research that would be useful too: Dr Alan Gadian (RMetS editor) is up to steam on this but needs some way of shoehorning the funds to do the necessary research on the easterly waves issue, so I am trying to organise a OR paper that should help enforce the case for funding. I just came across a paper that links changes in Earth’s angular momentum to ENSO and PDO. A few milliseconds of length of day are periodically converted into increased Atmospheric Angular Momentum driving wind flows that become copupled to oceans. If this link doesn’t work the 2012 paper is at Academia.edu by R. Abarca-del-Rio1∗ , D. Gambis2 , D. Salstein3 – Free with registration or free preview. Thanks for the link, eVince. I understand that the sea rise dire warnings are due to satellite measurements and not land based measures on harbour wall and jetty’s. These show nothing unusual except a small rise in line with our being in a Holocene when ice melts and sea levels rise. Would I be right on thinking that measuring the oceans is difficult from space due to the rise and fall of the waves? The trough between wave and the crest could vary significantly depending on weather conditions and tides and also low and high air pressure must come into play. James, I wouldn’t worry about waves as they should have no impact on trends. I also don’t recall any scientific discussions about the impacts of sea level pressure on trends…though I suppose there might be studies on that topic. Sea level rise is a local concern, not a global one. Satellite-based global data are a nice thing to have for global warming research but they’re useless for determining how communities need to respond. Just wondering whether the seeming correlation between UAH ( I guess RSS) and ENSO values since Dec 1978 is just spurious or there is some merit in considering it further. frankbrus, there is a well-known strong (but lagged) response of lower troposphere temperature anomalies to ENSO. The problem now is to explain why your ENSO index is showing a negative trend while the lower troposphere data is showing a positive one. One explanation could very well be the fact that sunspot cycles peaked in Mid 1900’s and has been trending down consistently since then, in all “probability” causing warming, albeit with a substantial lag through increased cloudiness as per Svensmark’s theory. Clearly ocean temps are now in decline again in response to weaker sunspot cycles and will eventually cause significant cooling. One indicator of this is surely, the fact that the temperature response to the current strong el Nino appears substantially more muted than the one in 1998 which was of similar intensity. I therefore suggest we take the analysis back much further and combine it with sunspot records with some substantial lag. Unfortunately, I suspect we will struggle with the temperature data as there will be no more detailed satellite records before Dec 1978 and as we all know the Hadcrut/Giss data has been doctored to death. But one thing my graph implies is that the year to year variability of temperature anomalies is significantly influenced by ENSO developments, which we as yet struggle to anticipate. Hi Bob, I don’t think anybody knows more about The Blob than you, so I’m offering a wild speculation: You pointed out it was forming in 2010-2011, and enhanced in 2011-2012, in comments on Tim Ball’s 2016 article at WUWT. I was just reminded of the geoengineering event in 2012 in the same area, dumping iron in the ocean. Could the iron have resulted in the enhancement? I hate referencing the grauniad, but it’s the link I found today. Many other sources confirm location and timing, August 2012, 200 miles offshore. I think close enough to have dispersed into the same water. Worth looking into. Unintended consequences when facts are thoroughly misunderstood. Kent, I has a similar thought about 3 – 4 years ago. Additionally, there was study before that time where they dumped a lot of iron into the South Atlantic, wanting to see how something responded (plankton maybe?). I don’t recall finding a similar blob there.